Coming of age is difficult enough without having to do so on a planet that is not your own. That is the premise of this science fiction/action film that explores the experience of one of nine young children whose parents sent them to earth to save them from the genocidal invasion of the Mogadorians. But now, as each is coming into their unique powers, the Mogadorians have come to destroy them, invade earth and kill everyone. This happy little tale is directed by D.J. Caruso and centers on the fourth of these aliens, who goes by the human name of John Smith (Alex Pettyfer). Although indistinguishable from his human high school peers, John nevertheless finds it difficult to blend in. This makes him vulnerable to the Mogadorian hunters. But his chances to evade them and survive are increased by his guardian Henri (Timothy Olyphant) whose responsibility it is to watch over him until he becomes fully grown. But into John’s violent and lonely world comes love. After demanding that he risk his life to attend high school even though Numbers One, Two and Three have been killed and he knows that he is next, John finds Sarah (Dianna Agron). Their mutual attraction is immediate and love blossoms quickly. It is only after their budding romance is evident that Henri informs John that their species falls in love only once and it lasts forever. This monogamous biology gives a compelling message about the nature of true love. A complicating factor in the tale is Sarah’s former boyfriend Mark (Jake Abel), the quarterback of their school’s football team whose jealousy is taken out on John in ways that intensify his struggle to fit in. Also included in the tale is John’s human friend Sam (Callan McAuliffe), a brilliant science student whose father had disappeared in search of aliens. Both join John’s journey in ways that uniquely determine his path. 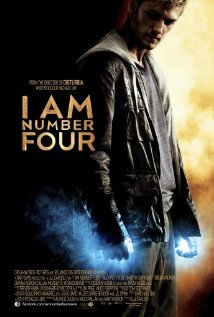 Suspenseful and yet predictable, with violent creatures and villains, “I am Number Four” is an unusual blend of a coming of age film with science fiction, but in the final analysis, it is a teen movie with a decidedly comic book feel. 1. When our bodies change in our teen years, our view of ourselves changes as well. As you watched John become aware of who he really is, did you identify with him? In what ways were you like him and in what ways were you different in your teen years? 2. The romantic ideal of following in love with one person for life is expressed in this film. Do you believe this may be true of humans but we’re ignoring it? Why do you answer as you do? 3. The appearance of Number Six (Teresa Palmer) helped John understand that it is in unity that evil can be defeated. Do you think evil can be defeated in real life? Do you believe unity is the necessary ingredient for that defeat? Posted on November 8, 2013 by Cinema In Focus and filed under 2 STARS, SHALLOW and tagged 2 STARS SHALLOW 2011 PG-13 RATED ACTION ADVENTURE SCI-FI.